J.Crew doesn’t usually fit me well, but I’ve been okay with buying their sweaters (especially simple, non-embellished ones) because in the back of my mind, I’m thinking, “oh yeah, that’ll shrink”. I picked up a few of the Honeycomb sweaters on sale, and have been wearing them as is for a little while now, but it was only a matter of time before I started getting curious about shrinking them. Since quite a few ladies also picked up this sweater, I figured I’d post my results, so you can see how this sweater behaves in the wash. If you don’t want this sweater to shrink, you may want to dry clean it. Note: I’m posting this only as a guide for what I did, and my unique results, in case anyone else was interested in trying it themselves. If you attemp to shrink your clothing, please know that your results may vary, and do so at your own risk. 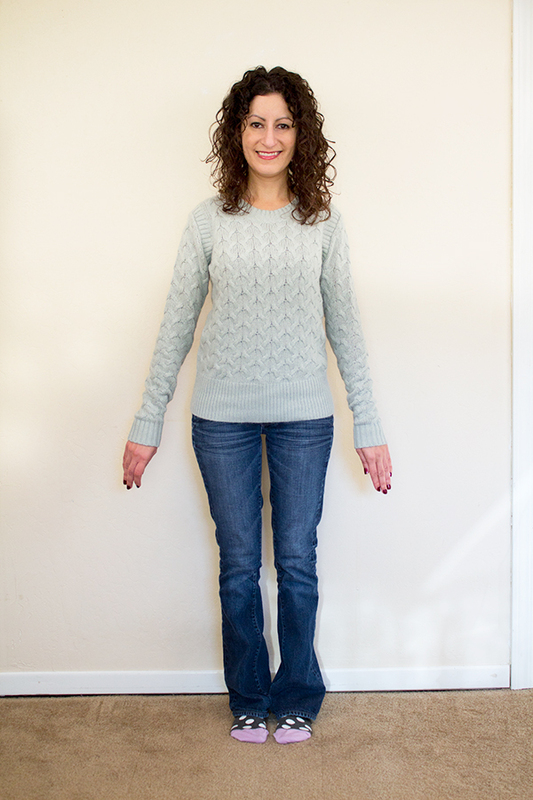 This is not the sweater I shrank, but here’s an idea of the fit before shrinking. Notice the length, sleeves, and fit in the torso. It’s not bad, and fine for laying, but I was curious if I could get a better fit. Note: the sweater looked like it shrank just from going through the wash. If you do not want your sweater to shrink, do not put in the wash! – Removed sweater from garment bag and dried in dryer on “low” for short bursts of time. – Let air-dry the rest of the way overnight. Notice the all around smaller and shorter fit. The knit of the sweater feels tighter, which is to be expected since the threads shrank. I hoped the dryer would alleviate some of the fuzz, but my sweater came out with little fuzz balls that are easily picked off by hand. I also went over the sweater with a sweater shaver, which helped a little bit as well. Up close, the fuzz of the washed sweater doesn’t lay as flat as the non-washed sweater. Even though the texture of the sweater changed slightly, I like the results and will probably pop my others in the wash shortly. See some of the other items I shrank, including J.Crew cashmere in this post. There are also some good shrinking tips in this post. I hope this is helpful to anyone who picked up these sweaters, and either want them a little smaller, or don’t want them to shrink at all. Good luck! Adventures In Alterations: InStyle Magazine Article About Tailoring…And It Features My Tailor! I’m going to try it! I actually bought 2 darkish colors (blue and purple) because the lighter colors looked too huge on me. Now I’m wishing I had bought the cream one! btw, forget to introduce myself. I just started my blog, and find out this big petite community, which provides lots of great petite informations for me. I prefer the shrunken version on you. Once you shrink something, how do you wash it thereafter? For example, if you are shrinking a dry clean only item, once you shrink it do you dry clean it moving forward or can you just continue to wash it on the delicate cycle? Good question Cristina! I take the behavior of the item in mind. For example, if the item instantly shrank, and then didn’t seem to shrink anymore after continued drying, such as this sweater, I’d deem it safe to wash at home going forward, since it already shrank all the way already. If I wash it at home going forward, it won’t shrink anymore, because it already did all it’s shrinking. So for this item, I’ll wash in a wash bag on cold & delicate cycle, and then let it air dry going forward (to keep the yarn in good shape since drying can damage threads and fade color). I might dry clean it every so often just so they’ll clean up any fuzz balls that will probably pop up under the arm, and where my handbag rubs. If the item looks like it will continue shrinking with further washing/drying, to be super safe, I’d dry clean going forward, especially if the piece is something you really love. The more delicate the item, the more caution you should take, and if you’re very worried about it, it’s probably best to bypass home shrinking and consult a knit alterations professional. Most knits (as long as they don’t have embellishments or panels of different kinds of fabrics) are fine to at least hand wash & lay flat to dry, but I have had some very thin knits (especially wool) come out looking wonky. Be very careful with the items you try and shrink. The texture may change, and details like zippers or button plackets may shrink at a different rate and become bumpy. Adding on to my last comment (sorry for the length! ), synthetic blend sweaters will shrink less, so it’s safer to continue washing them post shrink. Sweaters that are all natural, like cashmere, should be handled more delicate because even if it looks like they’re done shrinking, they can continue getting smaller with each wash. Thanks for this post! I’m sure it will help a lot of people. And I LOVE your socks! What brand are they? I have the greatest trouble finding socks that fit and I think my feet even slightly larger than yours! Do you find JCrew socks fit on the smaller side? I have a j crew sweater with a similar fit issue. I’d love to try shrinking it, but its fabric content is acrylic/wool/mohair. Have you had experience with materials like that, and if so, do you think the way I try to shrink them (washer/dryer settings or times) should vary? I just wouldn’t want the sweater to turn out to be totally unwearable. The sweater from this post is viscose/nylon/wool/angora, so it’s a very similar fabric content. The artificial fibers (acrylic/viscose/nylon) don’t really shrink, but the wool will, so the blending of those fibers will *probably* result in a small amount of shrinking, similar to the results I got, but I can’t be for sure. Is is a loose or tight knit weave? Tight knits won’t shrink as much as loose knits, so if it’s loose, be careful! Does the tag say dry clean? Have you tried to hand wash it? If you haven’t, and you hand wash or put in the washer on gentle, you’ll *probably* see it come out a little smaller, since that’s what I saw with this sweater. You can also try being super careful, and then work your way up if you want more results. One commenter on another post of mine only wanted the torso smaller, so she sprayed water with a spray bottle just on the sweater torso, and then put it in the dryer on low heat and checked on it often. She had good results. If that’s not enough, maybe try hand wash & air dry. If that doesn’t work, try washing machine (gentle & in wash bag) with super careful dryer drying. Looking good! Well..we tweeted about my OCD with caring for clothes yesterday! My only concern is how many times you can actually run the sweater shaver after washing this sweater. But I guess…once it has overly shrunken…what do you know…it’s time for a new one! HAHA and watch J. Crew recycle the style and put buttons on the sleeves next year…or shrink down the honeycomb weave pattern..I am so bad lol! So true. Once something starts getting icky, we’re bombarded with the same thing but in the newest cut/color with all new bells and whistles. And I’m such a sucker, I totally give in. Marketing works! LOL. That looks great! Shrinking a sweater with blended fibers is actually safer than one with 100% natural fibers — all wool / cashmere / cotton can shrink too much, too fast. The synthetic fibers don’t shrink so the overall shrinkage isn’t as dramatic. That said, I only do it with something I got on sale because the results are still unpredictable. Love your cute socks:) My mom is also petite, her special way to shrink sweaters in old days is put them into hot water, that would damage the sweater but in those days no fancy products could use, her method did a good job to make her sweaters fit. I think you did a fine job of shrinking! :) Looks great on you. I love your socks… and the sweater looks really great post shrinkage. I shrink my clothes often, but I always hold my breath a little when I do it. It’s like, do I risk ruining it or always having it fit a little too baggy. Most of the time, its better after shrinking. Ah, the life of a petite. Wouldn’t it be great if getting dressed wasn’t quite so high maintenance? !I like the shrunken fit on you! All the best for the other sweaters! My husband put my merino wool top into washer and dryer and now it will probably fit my 2 year old!! I agree. The shrunken fit looks better on you. Alright, you’ve gotta be sick of me saying this by now, but YOUR SOCKS! It was the first thing I noticed and I think I might own the same pair, hahaha. Kinda sad that I’ve lost count of what colors/patterns I own. I think I prefer the shrunken sweater if you wore a collared shirt underneath because the original version looks great as is for a slouchy-casual look. I thought the socks looked like J. Crew! :) My husband has accumulated so many J. Crew socks and Happy Socks, it is insane! At least he is easy to shop for! LOL! I love when boys wear fun socks. The boyfriend once had his boss stop a meeting in order to point out his ridiculously colored socks. It was a proud moment for me. Hehe. HAHA I do have the same pair! Well, almost. The polka dot colors are reversed but it’s got the same purple toe. I am not sure whether you can assume that a sweater will no longer shrink if it hasn’t done so after drying it (given that it already shrank in the washer.) I had purchased several Ralph Lauren cable sweaters many years ago that initially were too big for me. The first time I washed them they shrank to a size that was just perfect. After the second time they already become borderline too tight and too short. After the third wash the sweaters had the size of a sweater for two-year olds. And in fact in all these cases the drying never made any difference to the size of the sweater, meaning all the shrinking happened in the washer. Also, this happened in spite of the tag saying “handwash cold” and “tumble dry low” which is what I did. From my experience I would say that you have to be extra careful with sweaters that have a cable or honeycomb pattern because these tend to shrink a lot more than “normal” knit sweaters. I would rather not wash your sweaters any more but stick to having them dry cleaned now that they are the perfect size for you. The risk is too high that you may end up with a toddler’s size sweater. Oh! The armpit to armpit looks better if you plan on not wearing it layered! The shrunken sweater looks great on you! I usually handwash and use the water temperature to adjust the amount of shrinkage. Then I lay it flat to dry. If it needs to shrink more, I pop it into the dryer when it is damp, almost dry. I find this reduces the amount of wonky stretching as well as pilling that can happen even with the gentle cycle. Oh boy, I’ve never tried to shrink silk, but for some reason that though scares me! Does it get all wrinkly and bumpy afterwards? I did a couple of blouses that were too wide, too long, and the supposed 3/4 sleeves were awkwardly long. Turned out perfect! I actually machine washed gentle and put them in the dryer. The dryer smoothes out any creases, and the crispness returns after a quick press with an iron. I would only do it once though. I suspect repeated washing and drying would weaken the fabric. So hard to find a well-fitting blouse! Although I don’t buy too many JCrew items either, this is very useful!! Thanks for sharing. And I think the sweater looks really pretty on you!! Thanks for the helpful guide. I have AE sweater that get tighter every time I wash it but length is still the same. I guess it must be the material. Hi thank you so much for sharing! The shrunken version definitely looks much nicer on you. I’m 4’8″ and 75 lbs, i have real problem with finding clothes that fit well. May i ask you to clarify “dried in dryer for short bursts of time” ? Do you mean you let it dry for 5 minutes in the dryer at a time and then check on it before popping it back to the dryer for another 5 minutes? I’m not sure how long you leave it in the dryer and if you “pause” the drying time…. Thanks for clarifying! Hi Little_jlai! I put the sweater in the dryer for about 10 minutes at a time. Then I would take it out, look at it, and pop it back in again for another 10 minutes. After a few cycles like that (3 I think), I finally just let it air dry flat overnight. Coming out of lurk mode for a minute here to say thank you for this idea. I tried this to great success and now don’t have to lose yet another sweater to the Goodwill bin. Wish I’d taken before and after pics, though–duh. The sweater was a lightweight J.Crew cashmere/wool blend cable knit in cotton candy pink that was about 2-3 sizes too big overall–sleeve length, arm hole drop, waist, garment length. When I bought it I thought it’d be great for a slouchy look but instead I just looked unkempt and sloppy. Washed that puppy in a garment bag on cold/delicate, air dried it for about 20 minutes and voila–fits perfectly in every way. What a nice surprise! Getting ready to rip apart my closet to find some more offending sweaters that I can torture into submission. Love your blog! Thank you! The size xxs had a 14″ shoulder pre-shrinking and after shrinking measured about 13″. I think your sweater before you shrunk it looked more suitable for you. Now you look like a grown girl trying to get into kid’s clothes.